About Chaparral, a lot is published, said and taught on the internet. Much of it is true, a lot of it is crap. No surprise: even professional motor sport authors made and make serious mistakes about this complex stuff. Another problem is that if a writer intends to be complete, he'll need to write a complete encyclopaedia. And if the ambition is to grab the essence, what the hell do you leave out? So the (internet) reader is left with the question whether to believe the provided information or not. Or worse: doesn't even know the information is questionable at least. That's why The Chaparral Files comes up with the definite Chaparral story in a nutshell. It's the essence as taken from numerous articles and books. And thoroughly cross-verified over the years. So if you are looking for the most realistic, basic Chaparral story this is what you have waited for. And always remember: never take Chaparral internet information for granted! James Ellis (Jim) Hall, born on the 23rd of July 1935 in Abilene Texas, lost his parents in an airplane crash just before he started to study geology. His two brothers took over the family oil business. Jim changed course after a while to study mechanical engineering. Along he started racing cars, even with exotic European vehicles like Ferraris and Maseratis. For a short period of time in the late fifties, together with fellow Texan Carol Shelby, he operated a sports car dealership in Dallas. Young as he was he became a very mature and respected driver and drove some open wheel formula cars and even entered some US and Mexican Grand Prix races in the early Sixties. He did reasonable well and earned a seat in the 1963 formula one team of The British Racing Partnership. After that experience he decided to concentrate on developing his own cars only. In 1961 Jim and a few other fellows bought a piece of scrubland six miles south of Midland TX and designed and build a racetrack over there: Rattlesnake Raceway. One of the guys was James 'Hap' Sharp, another oil man, born January 1 in 1927 in Tulsa. He had been one of Jim's customer in the dealership days. In one of the first races on the new track a driver lost his life in a crash and it was decided not to continue as a racetrack. 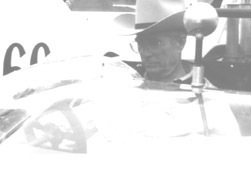 Jim and Hap bought out the others and used the track for testing purposes only and Rattlesnake Raceway became Chaparral Cars Inc. home ground. In 1961 Hall financed development and production of the front engined sports racer Troutman and Barnes (of Scarab fame) were thinking about. It was to become the Chaparral 1. Intended as a production racer, in the end just five cars were build. Two of them were raced by Hall's team in 1962 and 1963, the other three were sold. All five cars have, more or less, survived time. The concept of the car was already outdated when it appeared but nevertheless it was rather competitive and gained considerable success. More important, it was Jim's engineering test bed. If something didn't work out he couldn't blame anyone but himself, so his capabilities in this field grew considerably. In 1962 Jim started development of what he always has considered as the first true Chaparral, the Chevy mid-engined 2. It was very advanced from the start, not only because it had a monocoque chassis, on top of that it was made of GRP (glassfibre reinforced plastic) a novelty in racing. In the process of development Jim met some engineers from Chevrolet R&D, they interchanged information about their projects and the basis of what would become a very fruitful cooperation during the decade was laid. In fact Chaparral became part of the illegal, unofficial racing program of Chevrolet, doing lots of testing work for them on Rattlesnake Raceway. One of the first components that came from Detroit was the famous 'automatic'. In essence it was a torque converter connected to a single speed gearbox. At the tracks Chaparral always covered the device with a carpet or something else with added to the mystery. In 1963 three races were entered without very much success but in '64 and '65 the unique combination of 'plastic' chassis and automatic, combined with the driving skills of Hall, Sharp and, incidentally Roger Penske, produced numerous victories during the SCCA seasons, making them the dominant force. During the years the 2-cars also served as a test bed for aerodynamic research. Hall was a dedicated airplane pilot and that helped a lot to understand aerodynamic principles. A vast array of flaps, taps, louvers, holes, scoops, noses, tails, screens, spoilers and at last the low moveable wing were tried on he cars, profiling Hall as one of the most prominent aerodynamics specialists of motor racing of the period. This car is believed to have never appeared in public. To this day it remains a little bit of a mystery as there are no pictures of a Chaparral 2B. I think it actually is the GS-IIB roadster of Chevrolet R&D, an aluminum sports car they produced for research purposes. It was even lighter then the 'plastic' 2. This car provided the actual chassis for the next Chaparral, the 2C. The aluminum 2C resembled the 2 in many ways. The swooping lines, the aerodynamic add-ons, the automatic transmission, etc. But it was all white (whereas on the 2 the brown chassis always was/is visible), it was narrower and lacked the prominent scoops in front of the rear wheels. Most important, it sported a driver operated moveable low wing at the back, mounted to the bodywork. The small block Chevy was mated to a 2-speed automatic. The lone 2C was entered late in 1965 in just three races. One race it won (Hall's last win in competition), in the next it did not start and in the last race the car was wrecked in a crash. The chassis was rebuild to become the 2E, the first Chaparral Can-Am contender. Two 2 chassis were equipped with a roof to race in the 1966 FIA endurance series. Grown tire sizes meant wider fenders giving the 2D its distinctive 'coke bottle' shape. The 2D kept the Chevy small block but got the 2-speed 'automatic'. Again different aerodynamic bodywork specs were tried. Principle drivers were Jo Bonnier and Phil Hill. Although the car was more than a match for the more established competition, the team experienced a lot of mechanical trouble during the season. One race was won however: the ADAC 1000 on the Nürburgring. In 1967 one 2D was entered in the Daytona 24 hours and Sebring 12 Hours. Fitted with the big block Chevy and a three-speed automatic it once again didn't finish both races. 1966 saw the birth of the legendary Can-Am series. Intended to be as rule-less as possible, it was the most unlimited sports car racing class of FIA. The best class Jim Hall could possibly think of. The 1966 2E Can-Am car was the successor to the C. In fact it was a new aerodynamic concept on the existing, repaired aluminum 2C chassis, still equipped with the small block Chevy and the 2-speed automatic. A second 2E was build from scratch. The racing community were astonished when they first saw the radical different car. The bulbous lines, the moveable wing on very high struts, directly attached to the rear suspension, the rearward moved fighter plane type radiators, the integrated front wing, it was all VERY uncommon. However, advanced as it was, the car won just one race, with Phil Hill behind the wheel. To this day the 2E remains Hall's favourite brainchild because of its smooth handling capabilities and easy adaptability to different circuits and circumstances. A continuation series is underway at Rattlesnake Raceway, using the original moulds and patterns, etc. It will be FIA legislated for historic racing. Meanwhile, for the 1967 endurance season, the two 2D's were changed into 2F's. The big difference was the use of the big block Chevy and a 3-speed automatic. The chassis were widened and the cars had the side mounted radiators, the front aerodynamic 'door' and the high rear suspension mounted moveable wing of the 2E although in a far more 'blocky' design. These cars also met many mechanical problems and did not finish all but one race. That race was the finale of the season and Phil Hill and Mike Spence won the BOAC 500 at Brands Hatch with a 2F. The 2F's were to be the last conversions of the original 'plastic' 2 chassis of 1963. They were also Chaparral's last efforts in endurance racing. Like the 2F was the 'next generation 2D', the 2G became the 'next generation 2E'. One of the 2E's was written off by Hap Sharp in an accident in late 1966, so there was only one aluminum chassis left to become a 2G. Instead of building a second one, Hall decided to attack the 1967 Can-Am series alone. So, the one 2G was equipped with the big block Chevy and 3-speed automatic. Originally, apart from the 2F-like design of the radiator intakes, in appearance the 2G resembled the 2E very much. Later, all kinds of alterations were made to cope with the ever increasing competition of the McLarens and Lolas. Specifically the ever growing width of the tires meant the infamous 'truck fenders' in the end. Although it scored three second places, for a Chaparral it became a strong disappointment, never winning a race. The engine was a leaker, the narrow and low chassis was never meant to carry the steep increasing kind of mechanical loads. Worse: it had yet to go for another season because of serious development problems with the 2H. Even more worse, the car ended Jim's career as an competitive driver when he very badly crashed at Las Vegas in 1968, putting him in a wheelchair for months. In a way the 2H was the straight successor to the original 2 in that it returned to GRP as the chassis material. The 2H was in many ways the most radical and advanced racing car of the period (and far beyond). Read 'The 2H mystery' for all the details. The basis concept was to reduce aerodynamic drag by reducing the frontal surface to the max and spoil as little airflow as possible. Added to that was the idea to use more road space by making the car as narrow as possible. As a result it was the most complex racing car you could imagine. Development started already in 1967 and it was meant to race in '68. But because of the very serious technical problems it wasn't ready before summer 1969. In the end it was one big compromise. John Surtees was hired to drive it because Jim wasn't capable of doing it because of his accident. As it turned out Surtees hated the car and the season became Chaparral's most dramatic season ever. A year to forget but a car to remember! What can be said of this one? Nothing? A lot? Maybe the letter 'I' simply doesn't match the 2 very well? Maybe this is the biggest of all Chaparral mysteries. As far as I know nobody, I repeat nobody, ever mentioned or even missed this type. It has always been neglected completely..
Well, let me make a guess, just to shake things up: it was the forerunner of the 2J, just like the 2B (née GS-IIB) was Chevrolet's forerunner of Chaparral's 2C. The crude device that arrived at Rattlesnake from Detroit was in many ways not complete and certainly not race ready. So it is logical to consider it a kind of MK 1 2J? The 2J was the successor to the 2H for the Can-Am series of 1970. It was the famous ground effects 'vacuum cleaner' that sucked itself to the road surface by means of the auxiliary snow mobile engine that operated two giant fans at the back of the car. Originally it was a testing device from Chevrolet. Together with some engineering help it came to Midland to see what could be achieved with the system. Other than the 2H this car showed very much promise. First driven by world champion Jackie Stewart and from the second entry by Vic Elford, it took pole at several occasions as well as fastest laps. It was clearly the fastest car of the field and obviously the thing to have next season once the problems were sorted out. Unfortunately it always broke before glory but a lot of competitors feared for their future and complained at the FIA. Subsequently the car and the engineering principle were banned from competition because of the 'no moveable aerodynamic components' rule. That was the point that Jim Hall decided to stop racing activity. As a side project in 1970 Jim Hall took over from Roger Penske to campaign the factory Chevrolet Camaros in the Trans-Am series with moderate success. Vic Elford won a race. In the late Sixties, Jim bought out Hap Sharp. Not much was heard about Hap ever since until he committed suicide in the late Nineties. After the sabbatical in the early Seventies, Jim started racing again as a team owner in partnership with US Lola distributor Carl Haas, very successfully entering Lola's in the second generation Can-Am and at Indianapolis (see racing other brands). After the team won the Indy 500 and Triple Crown in 1978 with Al Unser driving, Hall decided to take the challenge to win the classic race with a genuine Chaparral. Under technical direction of John Barnard the last Chaparral, the Pennzoil backed yellow 2K, was created. It was a Lotus 79 look-alike that brought formula 1 wing car techniques to the Brickyard. The first year they nearly succeeded. 1980 they won, with Johnny Rutherford driving, winning the CART championship as well. In 1981 the competition was on the same level already and Jim choose to continue with racing other brands again and then stopped for a while. In the early Nineties, in partnership with count Rudy van der Straten, he formed Hall/VDS racing to soldier on for a few years with moderate success before pulling the plug finally. In the mean time all surviving 2-series (A, D, E, F, H, J, K) Chaparrals were beautifully restored at Rattlesnake Raceway and today rest in piece in the Chaparral Wing at the Petroleum Museum in Midland. Accompanied and driven by Jim Hall, the cars make the odd appearance in historic racing festivals. Rattlesnake Raceway is still headquarters of one of the most fantastic racing car companies ever seen.